[S2302] Email from Brenda Bagwell dated September 2012 to Hunter Wayne Bagwell; Subject Line: Email about Julia Willingham. George Edward Bagwell Jr. was born on 9 February 1919. He was the son of George Edward Bagwell and Julia Mae Willingham. He was a Sergent in the US Army and was in an anti-aircraft unit in New Guinea. George Edward Bagwell Jr. died on 3 November 1973 in Miami, Miami-Dade County, Florida, at age 54. Asbury Alspaugh Bagwell was born on 1 July 1886 in Winston, North Carolina. He was the son of John Tillett Bagwell and Margaret E. Casey. Asbury Alspaugh Bagwell married Mary Ratcliffe before 1914. Asbury Alspaugh Bagwell and Mary Ratcliffe were divorced before 1929. Asbury Alspaugh Bagwell married Dorothy (?) after 1929. Asbury Alspaugh Bagwell and Dorothy (?) were divorced before 1940. Asbury Alspaugh Bagwell lived in 1940 in Los Angeles, California. He died in April 1972 in Oklahoma City, Oklahoma, at age 85. John Tilley Bagwell Jr. was born circa 1880 in North Carolina. He was the son of John Tillett Bagwell and Margaret E. Casey. John Tilley Bagwell Jr. married Bridget Mary Mahoney before 1911. John Tilley Bagwell Jr. died on 19 June 1928 in Manchester, New Hampshire. Bridget Mary Mahoney was born on 1 February 1880 in Tipperary County, Ireland. 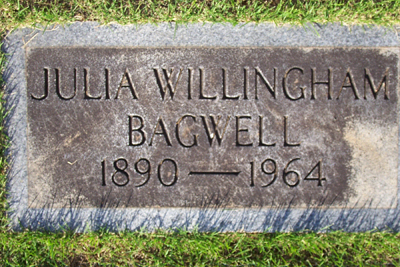 As of before 1911,her married name was Bagwell. She married John Tilley Bagwell Jr., son of John Tillett Bagwell and Margaret E. Casey, before 1911. Bridget Mary Mahoney died on 7 March 1958 in Naples, Florida, at age 78. Children of Bridget Mary Mahoney and John Tilley Bagwell Jr.
James J. Bagwell is the son of John Tilley Bagwell Jr. and Bridget Mary Mahoney. Catherine M. Bagwell was born on 2 April 1919 in Manchester, New Hampshire. She was the daughter of John Tilley Bagwell Jr. and Bridget Mary Mahoney. Catherine M. Bagwell died on 6 November 2001 in Manchester, New Hampshire, at age 82. Eugene Campbell Bagwell was born in August 1876 in North Carolina. He was the son of John Tillett Bagwell and Margaret E. Casey. Eugene Campbell Bagwell married Ina B. Redpath on 26 January 1907 at Manhattan, New York. Eugene Campbell Bagwell and Ina B. Redpath lived on 12 September 1918 in Bronx, Bronx, New York. Eugene Campbell Bagwell lived in 1940 in New York, New York, New York. He died on 18 September 1952 in Manhattan, New York, New York, at age 76. Al Province married Jewel Marie Bagwell, daughter of Bert Garrison Bagwell and Emma Lou Hawthorne.1 Al Province and Jewel Marie Bagwell were divorced.